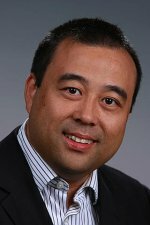 Dr. Guang Lin, a computational mathematics researcher at Pacific Northwest National Laboratory, has been invited to give a poster presentation at the prestigious 2011 Scientific Discovery through Advanced Computing (SciDAC) conference in July. In conjunction with the invitation to present, he has also been invited to prepare a five-page paper for the peer-reviewed conference proceedings. Lin is a staff member in PNNL's Computational Sciences & Mathematics Division. His talk "Modeling and Simulation of High Dimensional Stochastic Multiscale Partial Differential Equation Systems" will focus on research efforts to address current limitations on the science of uncertainty quantification (determining the variation of the likely outcome of research in a probabilistic way for risk assessment and decision support when not all the model input data is known) and to develop novel methods for modeling and predicting systems for use in extreme scale computing. Along with highlighting successes from the SciDAC program, the conference is also slated to be a "general celebration of computational science." The conference brings together computational scientists from different nations, agencies, programs, and scientific fields to highlight recent advances in computational science in important areas - from understanding our universe on its largest and smallest scales, to understanding Earth's climate change and its ramifications, to developing new energy sources.